Learn to draw with simple step-by-step instruction and helpful full-color photographs of in-progress exercises. The beginning of the book features a helpful introduction to tools and techniques before diving into the sections, organized by topic: gemstones, metals, hard surfaces, crystal & glass, water, and flowers. Each section contains three assignments. A fantastic way to master drawing certain objects or looks through a variety of enjoyable projects. 159 indexed pages, softcover. Artist and art instructor Leonardo Pereznietos realistic surfaces and texturesand his popular instructional YouTube videos on how to recreate themhave earned him millions of views and a devoted fan base. Now, for the first time, this international sensation brings his amazing skills to the page, teaching his drawing technique in 18 accessible, in-depth projects for beginning and seasoned artists alike. 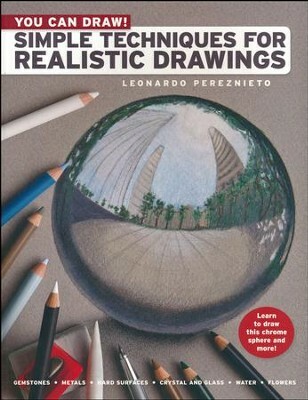 With detailed recommendations on proper tools and materials along with step-by-step tutorials for drawing lifelike surfaces and textures such as metals, gemstones, flowers, water, glass, and more, this stunning book gives deeper insight into the process of drawing astounding, true-to-life images. Leonardo Pereznietos work has been exhibited internationally in prominent museums and galleries in cities including Florence, London, Paris, Seoul, Los Angeles, and New York. He regularly conducts workshops and lectures worldwide, as well. His highly successful YouTube channel, Fine Art Tips, releases a new art instruction video every Tuesday to more than 370,000 fans and subscribers. He lives in Mexico City, Mexico. I'm the author/artist and I want to review How to Draw Amazing Surfaces and Textures: Simple Techniques. Brilliant Results.